When Samsung launched its first Note phone six years ago, it defined a new category of phone: the phablet. With its huge display and stylus, it was a unique entry in the smartphone market, adding handwritten notes and sketches to the standard lineup of smartphone features. Over the years, Samsung has only improved on the formula, making better styluses and better software to use with them. If you were interested in a smartphone to jot notes or doodles on, the latest Samsung Galaxy Note was the phone for you. But it’s now been two years since Note lovers have been able to upgrade, thanks to an unfortunate battery issue that caused the Note 7 to be banned from commercial flights and ultimately be taken off the market. 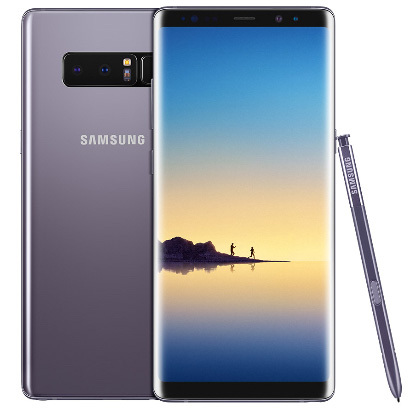 Now, Samsung is aiming to put the Note's past problems behind it with the introduction of the Galaxy Note8, the next generation of this popular line. Here’s what you can expect from the new flagship device. On the outside, the Galaxy Note8 doesn't look that different from Samsung's previous flagship phone, the Galaxy S8 Plus — and you'd probably be hard-pressed to tell them apart. Both have large Quad HD+ Super AMOLED Infinity display. The screen stretches from one edge of the phone to the other, wrapping slightly around its softly curved sizes, which makes the most of available display space. It was a good look on the S8 Plus, but the Note8 brings some subtle improvements to the design. The Note8's screen doesn't wrap quite as far around the phone's edge, which makes for easier writing and reading since the touchscreen itself doesn't hit much of that curve. It also sports a slightly larger 6.3" display, putting it squarely in the phablet category the original Note created. But despite its massive size, the phone's 18.5:9 aspect ratio feels better in your hand than you’d expect — especially for someone like me with relatively small hands. As has become typical for top-tier phones, both the Note8 and the S Pen are water and dust resistant (rated IP68), so you can easily carry them anywhere, while a fingerprint scanner allows secure access to your data. 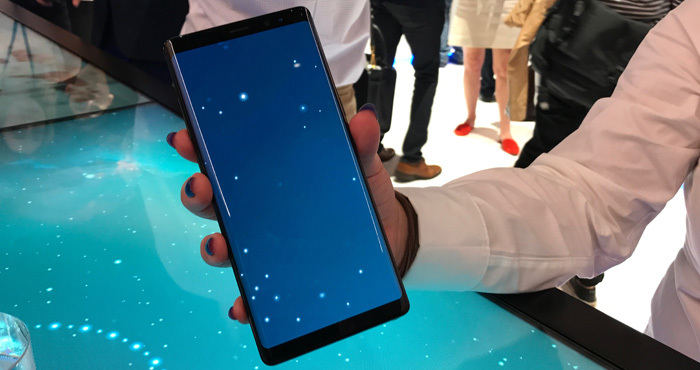 The Note8 adds a couple of less common features to the lineup, too, with speedy wireless charging and an iris scanner as an alternative to the fingerprint scanner for easy access. The Note's stylus, which tucks into the body of the phone when not in use, has always been a standout feature of the Note line, and that remains the same. With the Note8, the S Pen is even better, with an ultra-fine 0.7mm tip for precision writing and increased pressure sensitivity (from around 2,000 levels of sensitivity to around 4,000 levels of sensitivity). That makes the stylus more responsive, feeling more like an actual pen when you use it to write or draw. But Samsung continues to do a great job of integrating the S Pen with the software. 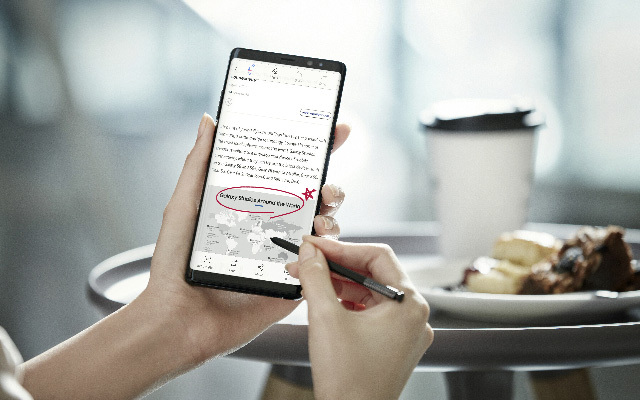 You can scribble notes (up to 100 pages of them) on the screen without even unlocking the phone, sending them to Samsung Notes or pinning them to the Always-on Display with a tap. It's just as easy to use as a paper notebook you might carry — perfect for jotting down grocery lists or capturing your thoughts on the go. You can use it to capture and annotate documents or photos and even tap on words or sentences to translate them. If you're looking for less productivity and more fun, the S Pen has that covered, too: the new Live Messages feature lets you send hand-drawn animations to your friends via the messaging app. The Galaxy Note8 will be the first Samsung phone to include two rear-facing cameras for added photo power. 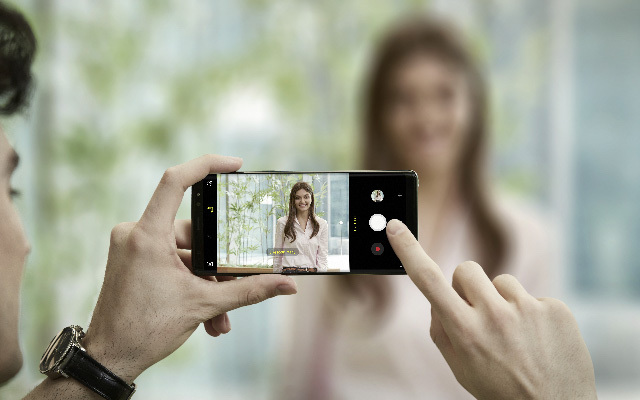 We've seen similar setups on flagship phones from Apple and LG, but the Note8 adds optical image stabilization to its cameras, which should result in crisp shots even when you can't quite keep the camera steady — and that's likely to make a big difference in your photo quality. The cameras themselves are both 12 megapixels, one with a wide-angle lens and the other with a 2x optical zoom telephoto lens. An 8-megapixel front-facing camera rounds out the camera lineup and is fairly standard for smartphones in its class. But the dual camera configuration opens up a lot of new features. Live focus lets you adjust your focus, making the background blurry or sharp — either before or after the image was taken. The camera performs well in low light, too, because the wide-angle camera lens captures more light, even when it's dark out. Fortunately, you don't have to be a photography expert to grab great snapshots, because the Note8 does most of the work for you. That means you usually just need to point, click, and wait for the results — or, at worse tap an extra button and adjust a slider. It should make snapping stellar snapshots a breeze. Where can I get a Galaxy Note8? The Galaxy Note8 is available for pre-order today, though you may need to break open your piggy bank to afford it. While the phone is priced differently depending on your carrier, it starts at $930 — but you'll find major carriers will let you pick it up for a more modest monthly payment in the $30 range. Right now, Sprint is offering the best deal on the Galaxy Note8 for anyone switching to the carrier, with a phone payment of $20 per month on the Sprint Flex program. Alternately, you could sign up for the company's Galaxy Forever program which lets you upgrade to the latest Galaxy phone annually. Galaxy Note8 will hit store shelves on September 15.